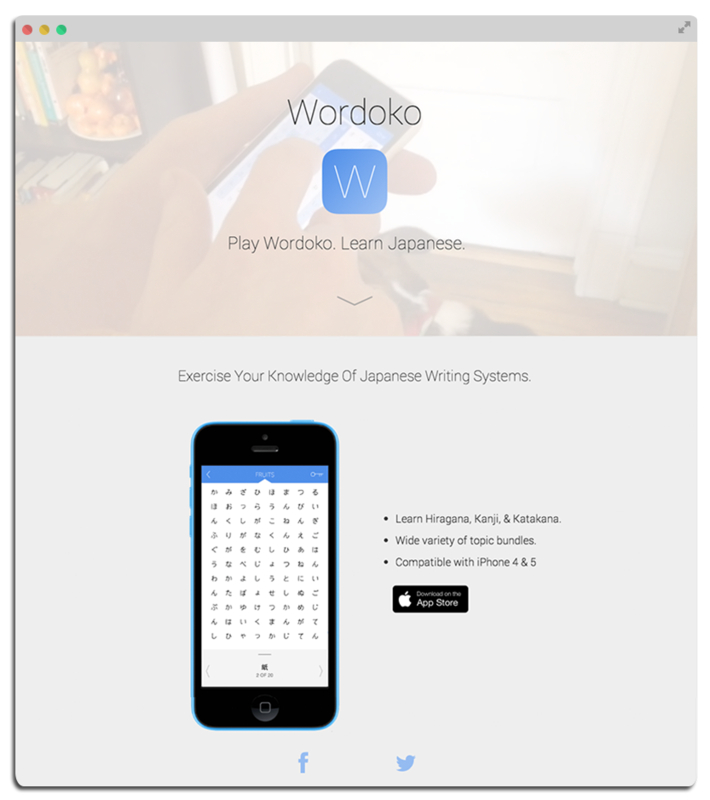 While working with the design studio, Great Job, I designed the UI for a word puzzle app called Wordoko. The intent of the app was to create an engaging way for Japanese speakers to practice their lexicon between the three writing systems; Kanji, Katakana, and Hiragana. Working with the UX designers and their iOS developer, I was responsible for the design of the identity, website, and user interface of the app. While the primary target audience are native Japanese speakers, there are also non-native speakers that would also enjoy playing Wordoko. The game provides a low pressure approach to learning Japanese vocabulary. My approach to designing the look and feel of the game had a few factors that needed to be considered. First, was that since the game would be on mobile, the interactions would be soley gesture-based. Another characteristic was that the design requires little to no barrier of difficulty in understanding how to play. Selecting a word in the puzzle, requires the player to highlight the letters. The element at the bottom of the interface is the word bank. The arrows indicate to the player that they can swipe left or right to view the various words they are searching for in the puzzle. The line icon above the word has the intent to allow the player hints. The user swipes up to reveal the word in English and the remaining writing system. I was inspired by the combination of Japanese calligraphy and the 'Wabi' in the philosophy, Wabi-Sabi. I thus created a minimalistic aesthetic that wouldn't detract from the content and interactions of the game. The key icon on the top right was created as a hint section. The player if stumped can press and hold the key icon to reveal answers. It was designed to only be viewed briefly instead of being just an answer key, so as to not make the puzzle too easy for the player. Wordoko is a word puzzle app designed as a method to practice Japanese lexicon in the three writing systems, Kanji, Katakana, and Hiragana. The idea was inspired by the present decline of Kanji used amongst the younger generations in Japan. Wordoko is a fun and entertaining approach to bring together language and technology. I had a great experience working with Great Job on Wordoko. It was my first mobile app design project. I understand the iOS design guidelines, and also the opportunities and limitations of designing for mobile. I used Sketch to create the prototype, and Bootstrap to build the website. Wordoko is now available for free at the iTunes app store Download it here.